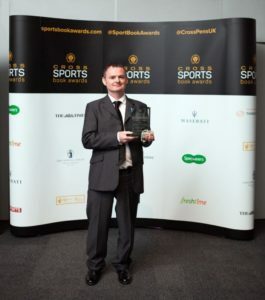 Hillsborough survivor Adrian Tempany has been crowned Freshtime New Writer of the Year at the Cross Sports Book Awards. 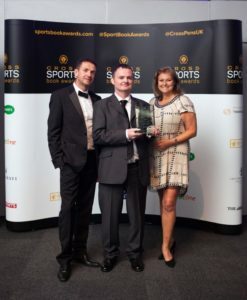 Representatives from Boston-based Freshtime attended the annual Cross Sports Book Awards ceremony at Lord’s Cricket Ground in London on Wednesday 24th May. The food to go and fresh produce business sponsored the New Writer of the Year category, which was won by Adrian Tempany for ‘And the Sun Shines Now’ – his definitive account of how Hillsborough changed football and Britain forever. Now in their 15th year, the awards promote outstanding sports writing and publishing from the last 12 months and showcase authors in nine different categories. After first sponsoring the Outstanding General Writing category in 2015, this was the second time Freshtime championed the New Writer of the Year. Adrian said: “I’m delighted to have won this award. It was only right that this year’s Cross Sports Book Awards celebrated the great achievements of established writers, including Hugh McIlvanney, but if sports writing is to remain important and vital, publishers need to invest in emerging talent. As part of its commitment to the community, Freshtime is dedicated to promoting an all-round healthy lifestyle, in which sport plays a big part. The company regularly sponsors games at Boston United FC and, in 2015, paid for new sports kits for Boston West Academy’s mixed netball team, Spalding United’s Under 12 football team and Fresh Produce Journal’s netball team. More recently, the firm also launched the Freshtime Futures Trust to help young people in Lincolnshire achieve their ambitions – sporting or otherwise – through financial support. Steve Evans, Freshtime’s newly-appointed Managing Director, said: “We’re always keen to promote healthy lifestyle choices wherever possible and nothing brings the team greater satisfaction than seeing people enjoying sports. Following a public vote, the Cross Sports Book of the Year has been announced as Forever Young by Oliver Kay, which tells the story of Adrian Doherty – the prodigious talent who looked set to spearhead Manchester United’s new generation of stars in the 1990s.